German heavy metal legend Udo Dirkschneider is back with another album with his band U.D.O. It's their fourteenth album and follows a change of lineup following the departure of guitarist Stefan Kaufmann. Udo Dirkschneider has used this as an opportunity to look at the last few albums and to make a few changes. The result is a sound that's more back to basics in comparison with say Rev-Raptor, and instead sounds more like the early U.D.O. albums. The vocals as always are distinctive - Udo has one of the most recognisable voices around and which over the 14 U.D.O. albums and several Accept albums has made him into a legend. His voice is sounding as strong as ever here, and as well as the usual metal anthems he also sings a ballad here which also works very well. The music is classic German heavy metal with plenty of power from the twin guitars and sounds great. 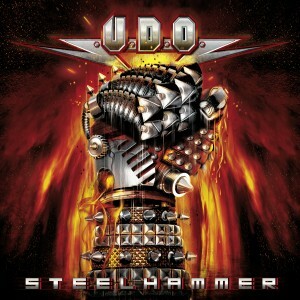 It's an extremely strong album - Udo is still in great form and tracks like 'Steelhammer' and 'Stay true' are just superb. The ballad, 'Heavy rain' is great - Udo doesn't do many ballads, but this track shows that it's not because he can't doa great job with them. An excellent album that's an essential buy for any fan of Accept.